As one of our most versatile promotional products, the popular BIC pens have always been a top choice for any hard-working company in need of promotional leg-ups, and they have been always one of our most sought products on the market. The Custom Bic Pens is the way to go, when your company seeks high-quality pens for any office work, printed with your company’s logo. 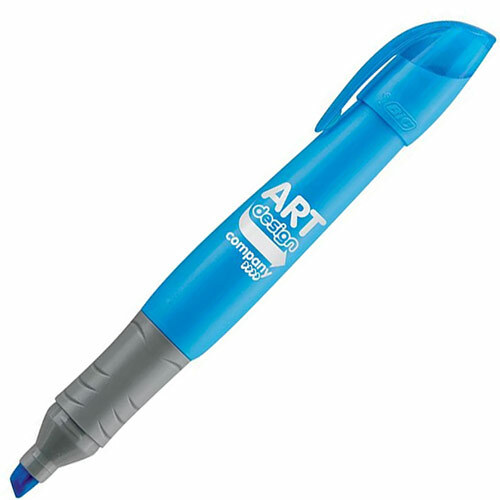 The BIC pens are customizable and we offer the unique option to print your company’s logo, as the ultimate promotional pens. We have only the best and up-to-date printing technology at our disposal to ensure high-quality branding which lasts a lifetime. If you are in need of some exceptional quality pens, look no further than the Ezy Promo Pens BIC pens. Our vast collection and options make sure that every customer finds what they are looking for. With an interesting and very rich history, we will look into the great pen giant and see why they are still the leaders among the most popular pens today. The BIC pens company started out small in the 40s, as founders Marcel Bich and Edouard Buffard decided to begin in fountain pens manufacturing in France. They got their name “BIC” in the 50s, with its very popular Crystal ballpoint pen gaining high attention on the market. The company caught a big wave, as the brand went on to become a force to be reckoned with on the market. BIC’s massive growth in production and financial success with the Crystal garnered them world-wide attention and they began mass production throughout the globe. Most importantly it became a household name, as a synonym for pens. BIC Pens’ debut on the US market had its flamboyant entry with the acquirement of the Waterman Pen organization in 1958, and by 1969, BIC pens expanded the empire in many European countries, and the rest of the World with its trademark quality products, thus creating a global standard in pen manufacturing. Additionally, the high popularity meant more business opportunities and expertise in creating products other than pens like shaving equipment, white-out, and the almighty BIC lighter, which will go on to become a world-wide standard as big as the BIC Crystal ballpoint pen. It’s important to mention BIC’s high regard of the importance of environmental consciousness and ingenuity. From day one, the company has followed strict rules and values in raising environmental awareness and social responsibility with its products and method of manufacture. To this day, BIC factories daily produce and ship over 31 million pens throughout the World. The brand’s high gain of reputation owes to the fact that BIC keeps promoting environmental consciousness with eco-friendly manufacture methods and recycling. This is what made them a true standard in the pen industry. BIC specializes in ball-point pen manufacture, but they are also famous for many other high-quality products and apparel. They are budget-friendly, durable, and can last long. An ideal promotional product which surpasses any other promotional pens, the BIC is a must have for your company’s offices. At Ezy Promo Pens, we highly encourage our customers to check out and browse all of our BIC pens we have to offer. We are sure you’ll find the perfect pens suited for your needs and some promotional pens are more affordable than BIC pens, so please feel free to browse at your leisure.